Humans are born with an innate ability to process and understand language. It doesn’t matter if one is born in China, Argentina or Ireland. Simply through exposure, babies pick up essential communication skills – naturally and organically. However, a key component of this development is the ability to hear. For language pathways in the brain to solidify and evolve, babies must be able to receive and process sound. But for those who are born with hearing loss, this development doesn’t happen. This is why we offer Auditory-Verbal Therapy (AVT) at CCHAT. How Does Auditory-Verbal Therapy Work? The goal of Auditory-Verbal Therapy is to help people who are deaf or hard of hearing bridge the gap and develop the requisite communication skills that those with typical hearing take for granted. This type of therapy is useful at any age. But it’s critical for babies who are just beginning to explore the world around them. Hearing aids work by amplifying sound for children with mild hearing loss and can be safely worn by babies who are only weeks old. Mild hearing loss isn’t only considered if sounds aren’t loud enough, but also when sounds (like a conversation) aren’t clear enough. Cochlear implants work by sending sound directly to the brain – after bypassing the damage portion of the ear. This type of assistive hearing technology is best suited for those with severe to profound hearing loss. Again – these 4 developmental stages occur naturally for those with normal hearing. But among children who are deaf or hard of hearing, this process doesn’t happen organically. Mastering essential language skills requires the careful guidance of a licensed, credentialed professional. More specifically, AVT is best conducted by certified Listening and Spoken Language Specialists (LSLS) who are trained to use exercises, repetition, visual cues, and imitation to help babies understand how to associate sounds with their corresponding meaning. In addition, this process continues under the supervision of the baby’s parents. As primary communicators, parents are responsible for fostering a supportive learning environment within the home. At CCHAT, our mission is to help children who are deaf or hard of hearing matriculate into mainstream school along with their hearing peers. For many of our youngest students, Auditory-Verbal Therapy is vital to this goal. We begin with comprehensive screening to determine the type and severity of your baby’s hearing loss. This allows us to identify the proper assistive hearing technology for your child. Diagnostic testing also helps us customize the most appropriate AVT approach – based on your baby’s needs. Successful Auditory-Verbal Therapy isn’t something you can outsource 100%. For optimal results, primary caregivers must remain actively involved throughout the process – which is why we offer programs like Baby & Me. Participating in these on-site classes lets you see how the process works and can continue the basic lessons at home. Is Auditory-Verbal Therapy Right for Your Baby? 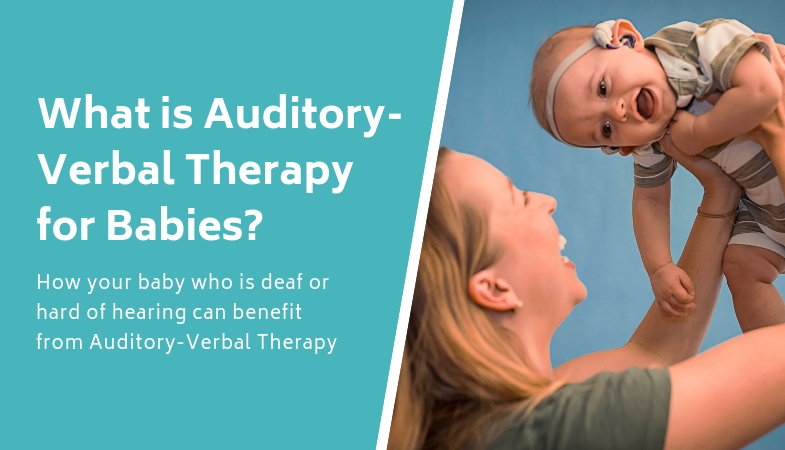 If your baby is deaf or hard of hearing, Auditory-Verbal Therapy may be able to provide him or her with the essential language skills needed for lifelong success. This is the approach we’ve used and refined to help CCHAT graduates thrive with their hearing peers in mainstream school. We encourage you to try out our program – especially since participation is free for babies under 18 months of age. If you’re ready to get started, schedule an appointment with us today.